Villa Caribbean Dream is a highly rated hotel in the south of St Lucia, with an incredible view of the wide open Caribbean sea. We welcome you to our home and offer you peace and seclusion in a relaxed neighborhood atmosphere. With the breath-taking views, private beaches nearby (about 35 mins walk or 5 minute drive) and local information and advice about St. Lucia’s sights and attractions, we will help you make the most of your trip. As a former tour- and airline representative who has lived in St lucia for over 40 years, I am very knowledgeable about the island. If you would like to experience the real Caribbean away from the tourist centers, and if you are interested in the local way of life as much as secluded bays, tropical rain forests, and activities such as kite surfing, horseback riding and zip lining, you’ll love Villa Caribbean Dream and surrounding areas. Just a short walk up the Moule-a-chique pensinsula is the second highest lighthouse in the world above sea level. 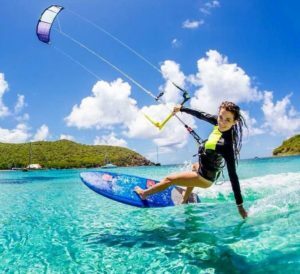 The nearby Anse de Sable (Sandy beach) offers one of the best kite surfing spots in the Caribbean. Villa Caribbean Dream is only an 8 minutes drive from the international airport Hewanorra in Vieux-Fort (UVF) and 1 hr drive from the small regional airport in the north (SLU). We recommend that you rent a car, but public buses can easily be accessed in the town of Vieux Fort, or we can arrange a private taxi or tour. Whether you’re looking for a nice quiet hotel in the south of St Lucia near the airport for a couple of nights or a base to explore the South of the island, or for a more long term stay to work on a local or remote contract, chances are that you will fall in love with Villa Caribbean Dream. The setting is beautiful and indeed dreamlike — a very well cultivated property nestled high in the hills, wrapped in dense tropical greenery, with quite spectacular vistas. Upon arrival we were immediately struck by the obvious love and care that has gone into its design and maintenance. As for food, we had been advised to pre-order the host’s exceptional breakfast — a very delicious and memorable US$12 feast of omelette, freshly baked bread, meats and cheeses, bountiful exotic fruits, and good coffee. We didn’t ask the host to prepare a dinner (as we were flying out too soon) but no doubt it would be every bit as good. Ah, the host! Brigitte (pronounced brig-eat’-ah) is quite a character. In old Reader’s Digest terms, she would qualify as ‘most interesting person’. Smiling and friendly, loquacious for sure, vulnerable yet steely in a Germanic sort of way — our stay would have been memorable just for our long conversations with her. After 40 years, she knows everything about what’s happening on the island. If, like us, you prefer to avoid pricey and conventional all-inclusives (we are non-drinking seniors so most of their offerings are wasted on us), consider Villa Caribbean Dream as part of your St. Lucia adventure, along with, we must say emphatically, the somewhat more expensive but fantastic self-catering places in Laborie called Driftwood by the Beach and the Bay Treehouse.